Twenty-six North Americans have committed to the Chihuahua Express, March 19-21. Another ten or so Europeans and twenty-two Mexican racers are expected to join the fun. Virtually all of the competitors have experience in La Carrera or have run the Express before. A few have signed up for the bracket class and the regularity T/S/D rally. The Express comprises three days of racing – 325 miles of top speed stages -- across some of the most remarkable landscapes in the world. It’s open-road racing at its finest--only 145 miles from Texas. Go to www.chihuahuaexpress.com and click on English for more info, or click on gbledso@aol.com to receive a three-page FAQ via email. Registration and technical inspection are a snap, the cost is low, the time commitment is minimal, just about any car may be enrolled, and the race organization is professional. In only three years, it’s become a world-class event. The Express Convoy leaves El Paso, Texas on March 17 for the short drive across the border and down to Chihuahua City. Eduardo de Leon, the President of La Carrera Panamericana, is predicting another big year for the event. Last year 107 competitors enrolled, up from an even 100 in 2008. Although North American participation dropped off in 2009 because of the recession, our European cousins made up the difference. According to the official rules of the event, North America (Canada and the U.S.) is limited to thirty entries, but we have been granted ten more routinely over the years. However, this may be the first year we are not allowed to exceed our quota. North Americans may reserve a spot on the grid with a deposit of $500. The deposit is non-refundable, unless the organizers refuse to accept your entry. Let me know if you are interested gbledso@aol.com. Increased use of the Internet, especially YouTube, FaceBook, and bloggers like Gary Faules, has raised the visibility of La Carrera and the Chihuahua Express enormously. 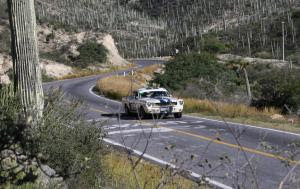 Now you can watch Pan Am cars blast through Mexican canyons only hours after the actual event and get nightly updates. For the first time last October, folks back home followed the race courtesy of Gary and his hardy band of amateur “reporters” and photogs in Mexico. Heck, he even covered the Coyote Convoy on its way down to Huatulco. Gary’s blog can be found at http://lacarrera2007.blogspot.com. Other bloggers provide excellent insights and content, such as the “soul” of LCP Marcia Blas at http://roadrallyrhythms.typepad.com. Another fine example is Kristin Vance's http://funksterwtf.blogspot.com. Michael Emery’s site www.LuchaLibreRacing.com provides excellent info about his team, beautiful photographs (he is a pro), and a comprehensive list of links. Even rookie Hayden Groendyke has a new web site--with an unapologetic title--http://www.winpanam.com. Hayden, who is no stranger to Mexico, is now actively promoting the Pan Am. This year a character called “CarreraCoyote” will “tweet” late-breaking news to Carrera competitors and crews before and during the event. To sign up for these messages, go to www.Twitter.com. Detailed info will also be posted more frequently under the “News” tab at www.panamrace.com or www.panamrace.blogspot.com. No official announcements have been made about the route of the Carrera for 2010. It is quite likely that the starting city will be Tuxtla Gutierrez. But anything is possible. We also have reason to believe that the “meta” will be Nuevo Laredo. 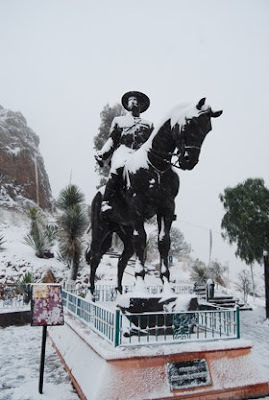 Other overnight stops along the route may be Oaxaca, Puebla, Queretaro, San Luis de Potosi, and Zacatecas. Wouldn’t it be nice to spend two nights in Zac? Most 2009 competitors who responded to a brief poll in November did not wish to spend another night in Mexico City or Guadalajara. With the new, magnificent toll road around Mexico City, it is much easier to avoid that traffic nightmare, even if a few laps on the historic Dos Hermanos racetrack would be exciting. The official route is determined by negotiations with the various cities and hotels along the route. The entire route will not be announced until much later. When it is posted on the official web site, “CarreraCoyote” will “tweet” it. Exciting, huh? Perhaps some day these negotiations will involve multi-year arrangements, so the route can be announced earlier, rather than later. Regardless, you may sign up by going to the main web site: www.lacarrerapanamericana.com.mx. The format is not user friendly, so you must have your blood type info, car info, and digital photos ready to upload in order to complete the registration. Alternatively, North Americans may use the entry form provided at www.panamrace.com. For new people, in particular, this form solicits information useful to providing them with the best advice and assistance prior to the event. The race organizers in Mexico make all decisions about the eligibility of cars. Hotels? Traditionally, those who enter the race first get the best hotels. Those signing up early have the best shot at scoring a room at the fabulous Quinta Real Hotel in Zacatecas, for example. However, more competitors are reserving rooms along the route via the Internet, rather than pay $150-300 per night to the race organizers for extra rooms for their crew or luxury accommodations. This was apparently the case last year in Huatulco, an under-utilized Pacific resort, where some competitors and their support crews stayed in less expensive hotels during the days before the race began. Everyone loves a good deal, but if this trend continues, it may result in a significant increase in the entry fee, since the two profit centers are inextricably tied together. On the other hand, the race organizers could index the cost of the hotel package to the dollar-peso exchange rate and the actual cost of the rooms, which are bought in bulk. They might also act as a travel agent, providing competitors more hotel options, and charging a reasonable commission. Certainly, they should reconsider the “once you pay, there’s no refund” policy. This newsletter may be copied, reprinted, and distributed with proper attribution. The views expressed here are the author’s and sometimes do not reflect the views of the organizing committee. You may sign up for or have your name deleted from this mailing list by a short email to gbledso@aol.com. One of the more popular festivities that everyone looks forward to that takes place during La Carrera Panamericana is the traditional Donkey Walk. It is believed that donkey walks found thier roots as far back as the birth of Jesus. Traditionally a donkey walk is a relaxing way to spend an evening walking along with fellow competitors and teams accompanied with musicians and a donkey who just happens to be carrying a load of tequila and other local spirits. Everyone is given his or her own shot cup which is tied around their neck with a colorful ribbon. Trust me, if they didn't tie it around your neck by the end of the evening you couldn't find it. Since the entire event has had everyone sleeping, eating and working on race cars it seems this is the only chance where everyone gets a well deserved opportunity to get to unwind and this is an evening that many new life-long friendships are born. As we all walk along the cobblestone streets we see some many of the most beautiful sites up close and personal. The musicians never stop singing and the tequila never stops flowing and at any given moment everyone will simply stop in the middle of the street and begin dancing. One of the things I loved most about the donkey walk is as you walk along locals or other tourist will simply join in and the crowd just keeps getting bigger until finally we reach the city square. Wouldn't it be nice if more people could walk along and sing and have a good time for no other reason than to enjoy each other. Thank you George for sharing this video taken during the donkey walk in Zacatecas. In San Miguel de Allende we all gathered at our hotel overlooking the beautiful cith down below. Local musicians accompanied us down through the cobblestone streets as other joined in along the way. One of the best parts of the donkey walk is getting up close and personal to many of the beautiful colonial sites. I know it looks bad but trust me... I went back to my hotel room alone. That's my story and I'm sticking to it. If you think the celebration ends at the end of the donkey walk think again. Now it's time to relax with some more spirits and dinner at one of the local watering holes. Even during dinner there is lively music. What a wonderful evening Mari Chris, Jon and I had as the city of Martinez welcomed us with open arms at the sold out showings of the world premier showing of the movie about my race car Lucky and Team California's Best involvment. Lucky was parked right in front of the theater and I was extremely happy with being able to hear everyone reactions during the movie. Afterwards Jon and I were invited up on stage for a Q&A session which put me right in my element. Afterwards I enjoyed signing autographs and taking pictures with so many wonderful people and new found fans of Lucky. My wife couldn't believe how many ladies asked where Will was. LOL. I would like to thank Steffan Schulz, owner of Strange Media for making this all come to be as a result of his amazing eye and many talents. Everyone of us who have raced LCP and spent time in Zacatecas can tell you it's an amazingly beautiful city and a hell of a place to race. I can also remember the late Jerry Churchill warning us at a drivers meeting, "Now listen guys... I kid you not, it can get very slippery on La Buffa in the morning and I have even seen ice on the road so please be careful." I bet Jerry is laughing today. Just take a look at Zac today. Event might be first annual film festival in Martinez. Move over, Telluride and Sundance. This coming Saturday at the Campbell Theater, the Martinez Inaugural Film Festival commences with two world-premiers and a six-minute science fiction short. Martinez filmmaker Steffan Schultz led the effort to bring a festival celebrating the cinematographic arts to the area. He met with Chamber of Commerce Executive Director Cynthia Murdough earlier in the month to pitch his vision of an annual multi-day event, and the two agreed to collaborate on this weekend’s trial run. “I love the idea of an ongoing Martinez Film Festival, and this is a great chance to test the waters,” said Murdough. Starting at 5 p.m., Saturday’s festival features three films made by Schultz, Rebirth of a Legend, Lorelei and Tracker. “Taking place from 1950 to 1954, La Carrera Panamericana is considered by contemporaries as the most dangerous car race in history, and my documentary chronicles California’s best racing team leading up to and competing in the modern day incarnation,” said Schultz, describing a 2000-mile, 7-day journey to Central Mexico. He added that the cast and crew of the documentary will be on hand to answer questions, and the racing car featured in the film, a 1965 Shelby GT350 Mustang entitled “Lucky,” will be parked outside. Tickets for the festival cost $7; due to limited seating, tickets at the door are not guaranteed and prospective attendees are encouraged to call the Chamber at 228-2345 to reserve seats. Gazette readers were introduced to Schultz last April when he screened his documentary entitled Hovsgol Nuur: Diving in the land of Chingis Kahn, a 48-minute film that followed a team of international scientists as they explored the environmental significance of two giant lakes on the Mongolian/Siberian border - 85-mile-long Lake Hovsgol, which provides 70 percent of Mongolia’s fresh water, and Russia’s Lake Baikal, the deepest and oldest lake in the world. You are dreaming about doing the La Carrera Panmericana but don’t know where to start? Make it easy for you by renting a car from Mats Hammarlund Racing! When you rent this car you benefit from our 12 years experience of building and servicing cars for the Mexican Road Race. 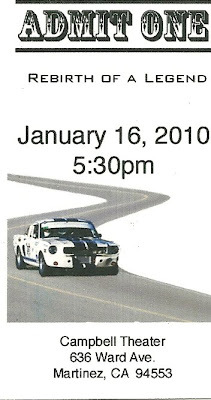 2009 we had four cars in the top 6 including first and second overall. 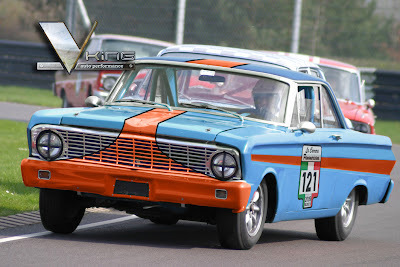 The Falcons makes very good rally cars and has been dominating the Historic C class for years. They were rallied in Europe by Ford in the -60 and because of that there are lots of good parts that are homologized for these cars. For example, the legal weight is a lot less than the Mustangs. The light weight not only translates in a very fast car but also in less wear on parts, better brakes and so on. This car is prepared from the ground up, just for the La Carrera Panamericana with all new parts. It has a Ford Motorsport 302 engine with a 4 speed Super T10 behind it. In the rear we are of course using a Ford 9 inch with limited slip. To stop the car there are Wilwood brakes in all four corners. This is a true “arrive and drive“ deal. You don’t have to worry about anything. You fly in to the start, the car will be there waiting for you, fully prepared and ready to go. Because this race is so hard on the cars, we take everything apart every night to check for unusual wear or problems. 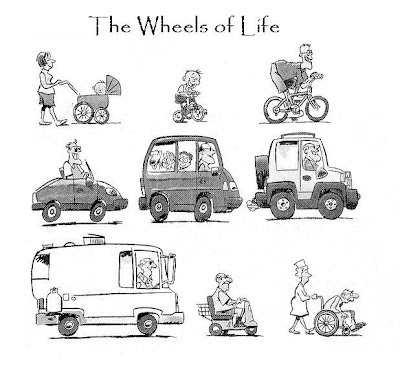 If something is wrong, we carry a full supply of spare parts so you can continue driving the next day. After the race, the only thing you are left with are the wonderful memories of driving flat out on Mexican roads! For more info, call or e mail.